When I developed an interest in alternative medicine I came across an approach to healing which I guess could loosely be called the ‘metaphysical’ approach. I suppose in an nutshell this is mind over matter, the way we work with our thoughts and use them to shape our lives. One of the major proponents of this wonderful way of thinking is a remarkable woman by the name of Louise Hay. Her words helped me change, to a certain extent, my attitude towards myself and my life and I am grateful to have received her insights. But in one way she let me down, and I’m still bitter six years later. She speaks of clearing out the closets of our mind. Let go of what you don’t need, shift the debris, dust your mental shelves. If it’s not serving you, let it go. Sounds fine, but I took it too literally. I cleared out the closets of my mind and the closets of my bedroom. Anything I hadn’t used for over six months was either given to charity, binned, or burned. It felt good, and I have never hoarded stuff since (learning to travel light has also helped me get round the world and teach, incidentally). But I got one thing wrong, very wrong. I chucked out all my Tintin books! Cleaning out the closets of your mind is fine but you don’t donate your memory to charity. 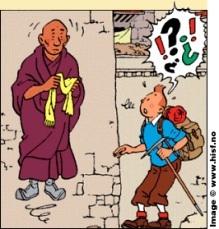 This wanton act of stupidity cost me one of the greatest comforts I have ever had, my collection of the adventures of Tintin, a hero so great that even the Dalai Lama spoke of his exploits, and his commitment to friendship and morality. 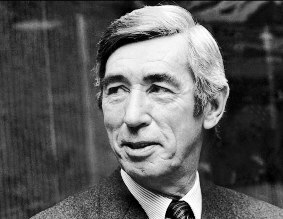 The great Belgian Georges Remi (Herge) created the wonderful character of Tintin in the 1920s or maybe 1930s and continued to publish stories of his life until (I think) 1974 with the final book in the series, and my personal favourite, Tintin and the Picaros. His careful research and attention to detail complemented the characters in the stories to produce magical tales of adventures which have inspired generations of children (and adults) for approaching a century. Their greatest quality is not so much their stories but their atmosphere, a strange sense of being there, at least for me, prevails and this leads to a very great empathy for the protagonists. Tintin, the ageless boy reporter with his faithful dog Snowy takes in almost the whole world in his stance against that which offends morality; organised crime, bullying, kidnapping to name a few. His enduring love for his friends leads him through dangers in many forms, artistic licence at times being his only saviour, this and a total eclipse of the sun of course. But what I like about Tintin is in fact why his appeal is not what it once was as the youth of today demands more intensity of their heroes, a most superficial quality. He is absolutely unspoiled, a Saint, untempted and unblemished, forgiving, determined and very committed to what he sees as right. And in most cases I like to feel I share his view of what right is. There would be exceptions to this, the social environment at the time of writing has led to unfortunate suggestions of disregard for equality on the part of the author, and I can’t say I applaud the act of terminating a rhino with dynamite (Tintin in the Congo), but viewed in context we too can be forgiving, can we not? Joining Tintin from an early adventure is Captain Haddock, an inspired addition to the stories and a fitting companion for the central figure. His faith in his friend is his quality, a tribute to the values of camaradery and trust. Then comes the more complicated Professor Calculus (originally named Professor Tournesol (sunflower) by Herge) (maybe an apt time to add that much of the magic of the English versions came from the translator Leslie Lonsdale-Cooper, a man responsible for such expressions as Blistering Barnacles) who adds an extra dimension and unpredictability. Parallel characters include the opera singer Bianca Castafiore, the bungling policemen Thomson and Thompson (who I add were not twins at all) and General Alcazar, among others. Oh, and Nestor the butler. Together they go to the moon, the Himalayas, the Amazon rainforest, the Egyptian desert, the Chinese wilderness. They get lost in Eastern Europe pursued by the police and army, they foil forgers on a desolate Scottish island, they go to the North Pole to recover a potentially valuable meteorite, launch a fancy dress revolution in South America and foil an attempted sacrifice by the Incas. It’s not real I know, hey, but how far is it OK to let fantasy influence reality? Fantasy is often only what we want reality to be. It might not be that we want to cheat death on a raft in the Red Sea literally, but we do envy the spirit of somebody who does, however farfetched it may be. If fantasy knows no bounds, it’s because neither does human spirit. Pretty pictures and implausible storylines are sometimes the best way to bring this idea back into the space we live in. 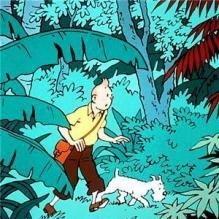 Few have done this better than Herge, and Tintin of course.